ukdodger wrote: Thanks CJ. I dont fully understand what you are saying but in spite of that I still think the rising and falling bit does have to do with oversteering and understeering if only because it makes sense that if your weight shifts forward it will increase the turn and if backwards it will fight the turn. Gyroscopic and trail effects notwithstanding that is. According to the book I'm studying deliberate oversteer is built into the fork rake to compensate for the Gyro and trail effect. Rising and falling surely does have something to do with it, which is why I said that statement in the book (Neutral steering simply means that the forks will neither rise nor fall when turned) was nonsense. I also think the book's use of the term oversteer may be misleading. And the suggestion that there is one perfect offset for a given head angle and wheel size is too prescriptive. The only simple way to sum this up is to say that there's a whole lot of things going on when you steer a moving bicycle, especially when you also lean it into a corner. Some of these things (mainly gravity) try to make the steering turn further into the corner, whilst others (mainly the combination of trail and drag) try to straighten it up again. A bike has nice steering when these factors are near enough in balance for a range of lean and steer angles that correspond with typical cornering situations, whilst providing enough straight line stability. Given the range of possible cornering speeds and radii, no geometry can be perfect in every situation. Any geometry will understeer a bit in some corners and oversteer in others. For any head angle there's a range of offsets that'll be good enough in most situations, better in some than others. The right geometry nowadays tends to mean as little trail as you can get away with before the bike becomes vulnerable to shimmy. With modern super-light frames, that tends to be quite a lot of trail, which is why the standard offset for ready-made forks is only 43mm. It works okay provided the angle isn't too shallow, when the trail becomes so much that the bike is over-stable in a straight line, but with a disturbing tendency for the steering to flop side to side if you rock the bike when standing on the pedals. Ideally you want the geometry that handles best for the way that you ride and that's not an easy thing to predict. Fortunately humans are so adaptable that we soon get used to and eventually prefer whatever kind of steering our chosen bike just happens to have. 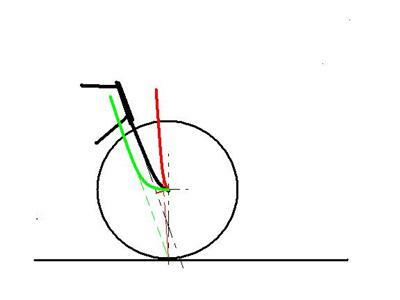 Cyclenut wrote: In spite of the fact that the three-dimensional geometry were are dealing with here is a lot more complex than this simple diagram suggests, that much is true: for all practical bicycle geometries the front of the frame does fall very slightly as the steering is initially turned. Although the whole thing is dynamic, and the bike is constantly leaning one way and then the other when you're riding it. To turn left, for example, you usually have to first steer very slightly right, to initiate a left-ward lean, and only then do you turn the bars left. Since the bike is leaning left that will change the geometry, and what would have been a fall at the headset when the bike is held vertical may not be a fall when riding. http://www.fonant.com – Quality web sites. I was trying to help the OP interpret the statement he quoted - something clicked as I read it and the meaning became quite clear to me. Going beyond that, to decide if it was an accurate statement would be a bit beyond me! One of the points I was trying to get my head around was the suggestion that leading link suspension could theoretically be superior to telescopic suspension. I noticed the the other day that the latest Moulton has leading link suspension. Perhaps I should have another try! The term "neutral" is different from the term "steering". One might ask what is being steered with respect to what. A rear wheel can steer about the steering head of a non-steered front wheel. Taking the centre of the top steering bearing to be a neutral point for rear as well as front wheel, the centre of the front axle could be vertically below this. If the centre of the bottom steering bearing were also on this vertical line and the front fork were of 90 degree rake with no trail, the front wheel could achieve neutral steering. However, holding the front wheel of such a hypothetical bicycle steady whilst steering the rear wheel would demonstrate non-neutral steering. The reason for this is that the rear wheel can not physically occupy the same space as the rear wheel. Have a look at some of those old "penny-farthings" to illustrate the point. If anyone is interested in measuring the steering height at various angles of turn, I might have a neutral twin-steering bicycle. Please contact me via my private mail or website. Whilst I'm here, does anyone know about gyroscopic precession please? If anyone has a copy of Tony Oliver's book "Touring Bikes", there's a nice graph which shows the acceptable fork offset for various head angles. A slacker head angle needs more offset to prevent the steering becoming overly "stiff", and a steep head angle needs less offset, or it becomes quite tiring to ride, requiring a lot of steering input to keep it going in a straight line. Typical figures might be 74 deg head/43mm offset (road racing bike) or 71.5 deg head/47mm offset (more relaxed "clubman" bike). Tandems are sometimes built with very little trail (i.e. more fork offset than is normally acceptable) to minimise lean steer, so when the stoker scratches their bum the ship doesn't lunge into the path of an oncoming car. All other things being equal, smaller wheels reduce trail and bigger wheels increase it. I have two extremes: a Brompton, for which the word "twitchy" might have been invented, and a track bike, where if you see a stone ahead in the road you *know* you're going to hit it. I've read that book, and IIRC the shallower the head angle the wider the range of acceptable fork offsets, so it's possible to make a touring frame with 72 parallel angles handle like a roadbike with thought controlled steering - but far more difficult to do it the other way round. As 'punk_shore' has had no replies so far to his request for info, I'm encouraged to post my two-penn'orth. Precession is a an effect exhibited by a mass spinning on an axis, or axle. The Earth is such a body, and exhibits a slow wobble, such that the North Pole describes a circle which takes 26,000 years to complete, against the background of the stars. At present, the Pole points to the Pole Star, but in another few thousand years, it won't. In technical terms, the Earth's axis precesses. A bike wheel is also a mass spinning on an axis (the hub) and would, if my understanding of the physics is correct, tend to precess if it were not clamped between the fork ends. The precession causes a force which will tend to make the bike steer to the right, but in the case of a push-bike the force is quite negligible as the wheel spins only slowly, isn't very heavy and the axle is only short. These are the parameters which determine the precession rate, or force. Perhaps precession might become of some significance in the case of a racing motorbike, where the wheel is heavy and spins at some tens of revs per second, and might cause some understeer on a left hand bend. It's just occurred to me of another illustration of precession which can be seen when an athlete throws the 'hammer' ( a heavy ball on the end of a cable). At the start, the hammer hangs vertically, but as the athlete spins, pivoting on one foot, the ball rises to the horizontal (it precesses vertically !) and above, until the release. It's a very technical sport of course, but that's the essence of it. So if a bicycle were travelling fast enough, the front wheel might exhibit precession. Precession with regard to what and about what? To suggest an answer to this latter question, the front wheel would precess with regard to the rear wheel. Precession would take place about the steering head. Precession would be more apparent when riding hands-free (off-road for safety). From my little bit of Gyro Theory, (different persuasion to mine), precession is a phenomenon that if you tip a rotating body, it turns. If you turn it, it tips. If you do neither, it remains static plus or minus Earths rotation. That's the way Gyroscopic Compasses work. Oh dear, I was afraid of this... I'm not sure that vector algebra is really appropriate on the forum, neither do I think that gyroscopic precession matters at all on a bike, but if you'll accept that I'm on the ragged edge of my Physics knowledge, I'll try to answer your question a bit more fully. A spinning disc, or wheel on an axle has three forces associated with it, gravity, angular momentum ( that is, a tendency to keep turning freely once it's started, hence the need for brakes!) and a torque (turning force) which must be applied to start the spin. These three forces all act on the wheel in different directions ( at 90 degrees to each other) and result in a force which is counter-intuitive, and causes the wheel/axle system to rotate in an unexpected direction. If the shaft is supported at one end only, and the disc is rotating fast enough, then the shaft remains horizontal and rotates (precesses) relatively slowly around the support. Incidentally, I have a toy gyroscope and have just tested it by hanging it from a piece of string at one end of the spindle and it precessed nicely when I spun it up. On a bike, the steering assembly would have to consist of a single 'drop-out' (is that the correct term? I didn't want to say 'a single fork'), to create the precession effect, which would probably be nullified by the friction of the tyre on the ground anyway. But the axle is clamped at both ends, so I should think that the precession in one direction is exactly counteracted by an opposite force in the other, and the axle tends to stay in the direction it was pointing when the spinning force was applied. Just as Mick F commented. employs a solid disc weighing some 60,000 kilos and spinning at about 500 rpm as a counterbalance against wave action. But on a push-bike? I say forget it! or to put it another way: gyroscopes function by spinning far faster than even I can get my bike wheels to revolve.. If you get a bike wheel, preferably a front so you are not mucking about with cogs, and hold it so the axle is resting on both index fingers, then spin it with your thumbs (you can, of course, spin it by any means you like including getting an assistant, doing it with your thumbs just shows it needn't be all that fast) then remove one hand it will remain balanced on that single index finger until it is only spinning quite slowly. It is presumably the gyroscopic effect which keeps it upright against the force of gravity. There is also the tendancy to twist, which I now understand is apparently called precession. I thought this was something everybody knew * - somebody must have shown me about 50 years ago - probably my dear old dad. * Balancing a wheel on one finger that is, not precession. A good test of precession is to sit on a good swivel chair with your feet up off the floor. Hold a bike wheel and set it spinning as fast as you can, and hold it tight and solidly. Then tilt it a bit. You'll find that the chair will swivel in the direction of the tilt. Good fun in an office environment when the boss is away! I'd go along with 98% of what's being said. My reservation is that someone appears to have taken a hacksaw to Newton's law i.e. every action should have an equal and opposite reaction. Now with my funny-bike (pictures under the publications tab on my website link below), the only reason the front wheel can have any directional authority is because the rear wheel transmits some of its gyroscopic stability via the compound steering head. Apart from being virtually unrideable due to my long legs, the main benefit of building this bike is to show that straight line & cornering theories for bikes should start by considering the rear wheel. Take any sort of bike, put it into a right or left turn of constant radius and at constant speed. Then see what track the front wheel will take. Yes, there will be some tyre friction, inclulding a component radial to the axle of the front wheel. This results in "tyre scrub" which is a stabilising force. Punk_shore wrote: straight line & cornering theories for bikes should start by considering the rear wheel. They do. Read the chapter on Steering and Balancing in Bicycling Science (DG Wilson, MIT Press 2004) and either be informed or bewildered!